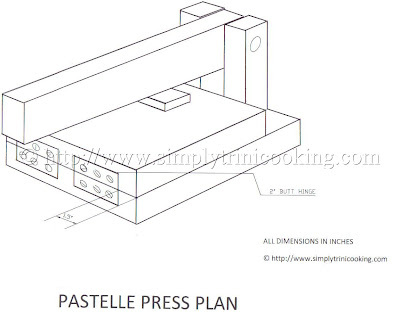 This is a simple plan you can use to make a pastelle press. I decided to draw it because I didn’t see any detailed ones online. I still feel that there may be a few minor adjustments to be made but I would only know for sure when I build one myself or get some feedback for the plan, so comments would be welcome. Also this plan is the same for a tortilla press but we don’t make tortillas in Trinidad so we call it a pastelle press. Same difference. So here’s my humble offering. 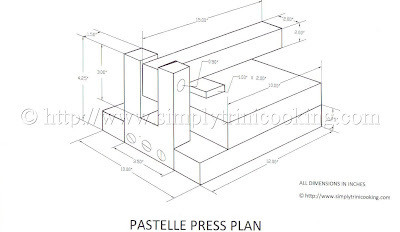 I hope you all build it and make your pastelle making a lot easier this Christmas. Right click and open it on a different page. If you use firefox you can press f11 to view the plan fullscreen once on the new page. Bye! Between the two faces you should leave about an 1/8″ space.